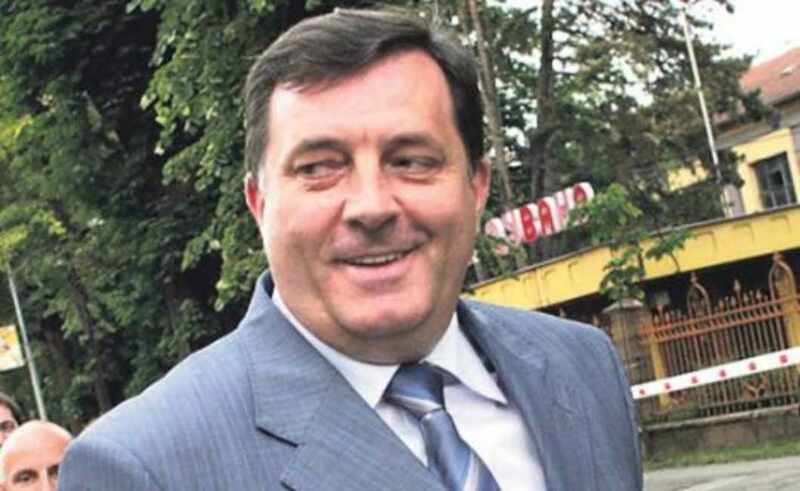 Meet Milorad Dodik, a leader from one of the poorest countries in Europe who claims he’s about to be overthrown by the United States government but is one of the biggest spenders on shadowy American lobbyists in the world. If anyone should know, it’s Dodik. The government of Republika Srpska pays a jaw-dropping number of consultants and lobbyists in Washington D.C. an enormous amount of money to do what appears to be almost nothing. As a sub-state entity, Republika Srpska spends more of its taxpayers’ money on American lobbyists than the majority of governments in the world, and more than any country in continental Europe besides Switzerland. 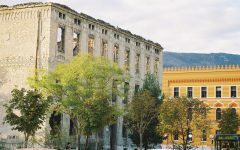 But whereas the breathtaking alpine bastion of banking secrets recently became the first country on Earth to see average wealth exceed $500,000, the GDP per capita of Republika Srpska is just $4,100, and more than half of its young people are unemployed. 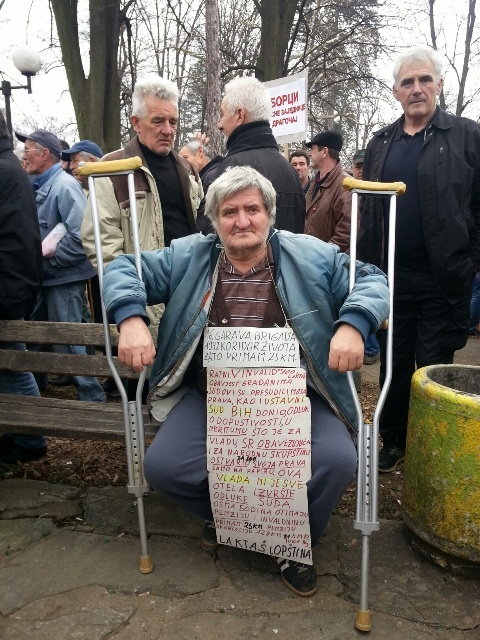 Hundreds if not thousands of discontented veterans have taken to the streets in recent weeks. Dodik knows this, but he’d prefer to spend these veterans’ dwindling pensions on a new team of PR professionals to keep himself in power. What’s really remarkable about Dodik’s dealings with pricey American lobbyists and Manhattan-based consulting firms is that they reveal just how fraudulent his supposed disdain for Western money and influence really is. 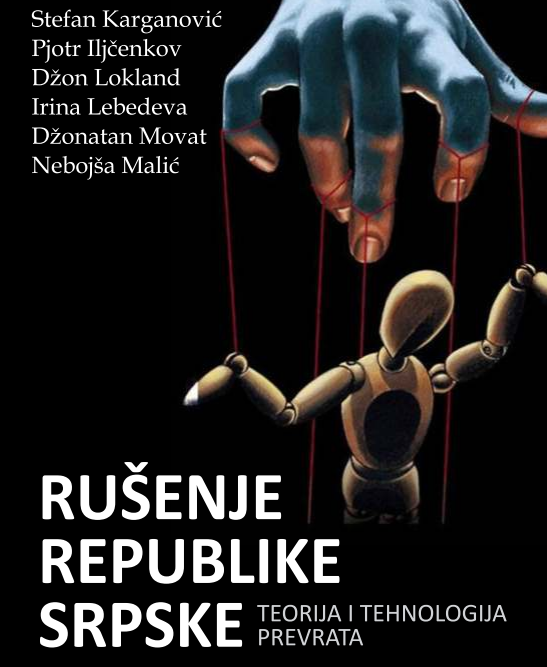 His Independent Union of Social Democrats just released The Destruction of Republika Srpska, a 225-page book that characterizes critics of Dodik’s government as traitorous puppets of foreign powers, and then blames the region’s many problems on CIA-backed “color revolutions”. 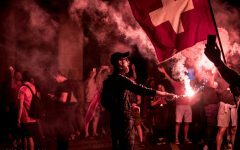 The authors say these “Orangists” who once helped the United States overthrow dictatorships in places like Serbia and Ukraine are now plotting to carry out a similar plan to depose of Dodik. But conspiracy theories about Western plots and imagined domestic collaborators are such a stale source of intrigue these days that many say the publication of The Destruction of Republika Srpska was just a politically-motivated effort to stymie the protests and distract from Dodik’s own failures after eight years in power. “This is just a desperate move from a party that has had the ability to do anything it could have wanted in recent years, but has achieved next to nothing,” Aleksandar Trifunovic, the editor-in-chief of BUKA magazine, explained to Balkanist. BUKA is often critical of Dodik, and was included on the list of Western-controlled “conspirators” in the new book. 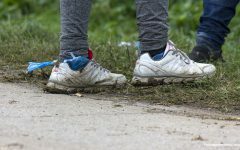 “The most convenient thing to do is to put the blame on someone else, and the easiest thing is to pin it all on ‘traitors and mercenaries of foreign governments,’” Trifunovic said. But any illusions of Dodik as a fearless warrior defying foreign governments and internal collaborators are shattered after spending about five minutes cruising the U.S. Justice Department’s Foreign Agents’ Registration Unit at www.fara.gov. Agents (usually lobbyists, lawyers, or consultants) working in a quasi-political capacity with foreign governments or politicians must be registered in the searchable FARA database. The Justice Department says the details of these relationships belong in the public domain because “the source of information (propaganda) and the identity of persons attempting to influence U.S. public opinion, policy, and laws” should be transparent. And a cursory glance at Dodik’s long list of foreign registered agents reveals that he recruits from some of the very same circles of shadowy American power he regularly rages against in the Dodik-dominated media back in Banja Luka or on visits to Belgrade. 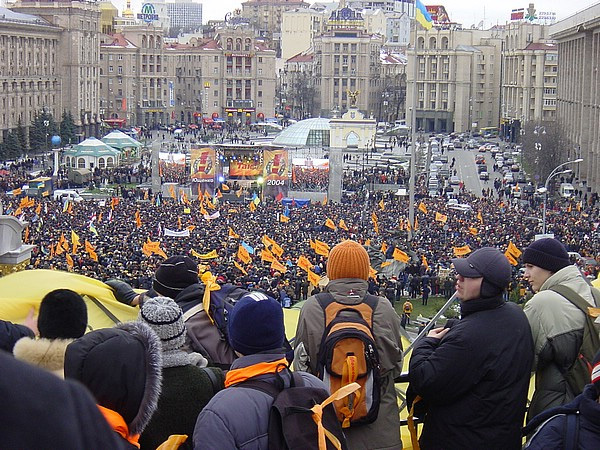 Ukraine’s “Orange Revolution” began on November 22, 2004, in Kiev’s Maidan Square. In an astonishing act of political hypocrisy, Dodik had hired Manhattan- and Kiev-based consultant Adrian Karatnycky, who served as president and executive director of the controversial NGO Freedom House between 1993 and 2004. During Karatnycky’s tenure with Freedom House, which one UN representative called a “machinery of subversion, closer to an intelligence service than an NGO”, some very color revolutionary activity seems to have gone on: The Atlantic Council says that “Karatnycky developed programs of assistance to democratic and human rights movements in Belarus, Serbia, and Ukraine”. Karatnycky left Freedom House to become a private consultant in 2004, and R. James Woolsey settled in at the helm. While Freedom House’s most passionate critics tend to drift too far into the basement-dwelling realm of New World Order conspiracy theories, it probably doesn’t help matters much that Woolsey is a former director of the CIA. Of course, Karatnycky’s name is not mentioned in the Independent Union of Social Democrats’ new collection of anti-Orangist essays, The Destruction of Republika Srpska. But the book does contain more than 30 mentions of Peter Ackerman, a person with whom Karatnycky has co-authored several works, including How Freedom is Won: From Civic Resistance to Durable Democracy. Suffice to say, the authors who wrote Dodik’s 250-page party pamphlet do not view Ackerman in a favorable light. The Destruction of Republika Srpska, the latest publication from Dodik’s Independent Union of Social Democrats. 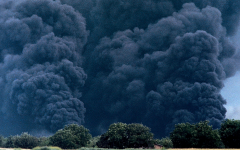 “Peter Ackerman and other ideologues of non-violent struggle formulated tactics of warfare utilizing civilians [as weapons],” one essayist explains in The Destruction of Republika Srpska. Karatnycky refused Balkanist’s request for comment on his client’s new book. He also declined to say if his three-year working relationship with Dodik had ever been negatively affected by their apparently divergent views on his past “Orangist” activities. Balkanist also contacted Milan Trbojevic, the head of Dodik’s media relations office, to ask about the government of Republika Srpska’s agreements with American lobbyists like Karatnycky, who many believe were involved in “semi-covert” regime change operations. “I’m not authorized to answer any of those types of questions,” he said. Despite Karatnycky’s past involvement in color revolutionary activities, the government of Republika Srpska continues to pay him $70,000 per month and has paid his Myrmidon Group more than $2.3 million to date. Dodik may be a complete fraud, but whose fault is that? Leaders like him no longer have to feign serious commitment to the ideals Karatnycky and his ilk were peddling when they arrived in the region in the 1990s and early-2000s. Now, Dodik can pay Karatnycky to “combat perceptions of Republika Srpska as an entity riddled by bureaucracy and corruption”. The message is no longer “don’t be corrupt” but “don’t appear corrupt”. There has been a profound transformation across the region, and PR (or “strategic communication”, as the consultants say) has filled the vacuum left by ideology. Once, young Americans with few qualifications found employment with U.S. government-funded development agencies in Eastern Europe. These earnest university grads believed that they were teaching wide-eyed locals about the wonders of democracy and open societies and switching “from Marx to markets”. Now, many of these same individuals are well-paid consultants or lobbyists who make millions creating simulations of democracy. It turns out there’s little “market demand” for changing anything of substance, at least not among the region’s compromised elite or the “international community”. So now the consultants rebrand nationalists as pro-Western democrats, and the corrupt rulers of ethnic fiefdoms as free market enthusiasts of fair play. The lobbyists communicate their client’s “ethnic hatreds”, but re-articulate them so they resonate with Westerners’ own prejudices. The communications strategists help eliminate the need for official censors by promoting conformism and fear, allowing self-censorship to take care of the rest. In other words, some of those heroic harbingers of democratic change have become frauds too. Milorad Dodik just happens to give significantly more money to them than almost anyone else. Shortly after he became prime minister in 2006, the government of Republika Srpska hired a company called Capitol Links. Their website is still up but their listed phone number now belongs to a Porsche dealership in Washington D.C. Capitol Links had a few colorful characters on its staff, but Dodik mostly dealt with a man named Gregory Minjack, who would serve as his “special representative” in the American capital. When Balkanist contacted Minjack for this story, he said he only worked for the government of Republika Srpska for one year — in 2005. But FARA documents say otherwise. Their records, which include Minjack’s signature, dates, and a personal letter to the new prime minister, make it clear that he didn’t even begin his special engagement with Republika Srpska until April 2006, and that he continued working for Dodik though early 2007. 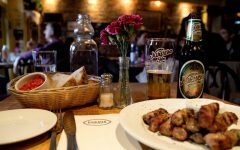 In other words, Minjack may have received a contract from the US government to work with Dodik in 2005, but FARA documents prove he became the new prime minister’s private “special representative” in Washington D.C. for a fee of $7,000 a month “plus business expenses” the very next year. In April 2006, Minjack signed a letter to Dodik with the words, “looking forward to working with you again.” While not illegal, these types of arrangements have raised ethical concerns about the myriad potential conflicts of interest involved. In 2011, Minjack completed a report evaluating a five-year (2006-2010) democracy development program in Serbia implemented by the National Democratic Institute (NDI) and the International Republican Institute (IRI) supported with $12,273,815 in funding from USAID. 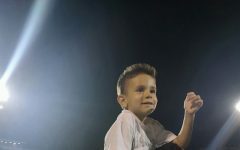 The content of the report appears objective, but Balkanist did ask Miljack if he thought there was any potential conflict of interest involved in his performance of the evaluation, as he’d been Dodik’s “special representative” for part of that period and Republika Srpska and Serbia enjoy close ties. (Dodik and Serbia’s then-President Boris Tadic have an especially close relationship). 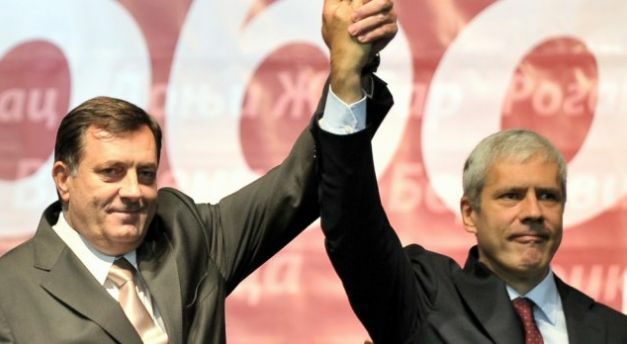 Dodik and former Serbian President Boris Tadic at a campaign rally for Tadic’s re-election in April 2012. The two are thought to be close allies. Like Karatnycky, Minjack’s first international work experience involved delivering democratic change to Eastern Europe. He opened the National Democratic Institute’s (NDI) first international field office in 1992, in Moscow. Exactly 20 years later, in 2012, NDI had to vacate its offices in Russia and relocate to Lithuania, as the Kremlin’s hostility towards NGOs grew. But Minjack has remained more than welcome in Russia. He’s written glowing articles and spoken at high-profile conferences as a consultant for his well-heeled Russian clientele. At one event attended by former American Ambassador Michael McFaul, Minjack attacked the entire Russian opposition. “What does one do when the competitors are so inept that they can’t find their way out of a dark room? And if there’s no competition in Russia, from what I’ve seen up close with the competing parties, it is not necessarily the state’s fault.” Of course, there is some truth to this: Many countries in the region have a fragmented or weak opposition. But Minjack’s bio on the aging Capitol Links website says he’s been paid by a variety of Russian interests. But then again, he’s also been a consultant for “Orangists” in Ukraine.